You have three options when installing social media icons on your wordpress website. You could have a theme (such as Genesis) that allows you to link to your social media icons. If a theme provides this support, it will also provide the formatting to make it look good. If you have this ability, you can input your social profile name into a box, click save, and be ready to go. 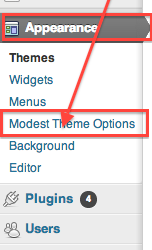 Lots of Elegant Themes have this option. 1. Go to the “appearance” and “theme options” panel, if available. If it isn’t available, it’d be worth checking your theme documentation. This is usually available in the “read me” section of your theme or from the site you acquired your theme. It’s worth googling something like “THEME NAME documentation” or if you remember the place you purchased it, going directly there. Alternatively, you can sometimes find the read me if you go to “appearance,” “editor,” and search the side list options for a “read me” page. Genesis, for example, has many formatting options for social profiles, but support them by giving you a code rather than running it directly through your theme (keeps your site lean and speedy). However, it’s hard to figure out how to do this if you’re not reading the theme documentation. You could use a plugin. Simply go to “plugins,” “add new,” and search for “social media” and you’ll find plenty of options. If you click the “details” button, you can then navigate to “screenshots” for an example of what the buttons will look like. If you can find something you like, it’s a great way to get your social profiles showing up on your site. Third, you can either find and download or purchase custom social media icons. A quick search will yield a ridiculous amount of options. Depending on your style and what you are looking for, this might be what fits you best. 2. Upload icons to your wordpress media library. Copy the location of the file (not the attachment page) to a blank document for reference. 3. Go to “appearance,” “widgets,” and add a new text widget where you’d like your icons to appear. Lastly, you may want to center these icons. The easiest way to do this would be surrounding all your images with a <div> tag. 1. Resize and upload the exact size of image you’d like to use, rather than using the “width” and “height” properties within the <img> tag to resize your image. 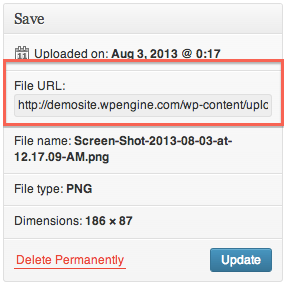 Then change the properties within the <img> tag to match the size of the icons you uploaded. Otherwise you are causing your server to load an image that’s too large for the way you are using it. 2. You can upload your images to sites like photobucket or google, but I usually recommend hosting your images directly with your site. This helps later on if and when you decide to move your site (all your images are together now) as well as eliminates the risk of your images being moved or deleted on one of these 3rd party sites. 3. You might be curious why I suggest using a <div> tag over <center> or tags that include certain widths and margins. Simple: browser compatibility. The <center> tag is not supported in HTML5 and using this method will center your images on almost every browser. Nice. I love this. Thank you! Works beautifully ; ) Site was receiving low score on GTmetrix ‘avoid bad requests’ all stemming from the social media plugin that was being used. Used this code with my own customized icons and now the ‘avoid bad requests’ score is an ‘A (100)’! Thanks again!! Works great, looks great! THANKS! I don’t understand how your code would pick up the title and url for each page. hello john, you are really great, thanks for your tutorial. you just made my work easier.Kudos!!! John I just noticed your floating social icons on the mobile version of the site. They are very cool. Are you doing this with a plugin or did you do something custom? Thanks. I can’t thank you enough for this incredibly informative and easy to follow guide. It took a little time, but I was able to get all our custom social media icons linked to our pages. Thank You! This is massively helpful thank you! I used the code that you recommended to Sarah @ Making Thyme for Health. However is there any code I can add to make the link open up in a different window please? Hi! Awesome tutorial, thank you! I am trying to install social media icons on my blog and the images are showing up as broken links. What am I doing wrong? Hi and thank you so much for this tutorial. I am a real newbie at WordPress and thanks to your tutorial I can do stuff that seemed impossible to me. Thank you for this tutorial!!! it was very helpful. I just have a question tho, when I click in each icon it takes me to the social media (facebook etc.) home page to sign up but it does not give the option to follow my account straight away. How can I make it go to the “follow me” option as soon as someone clicks on the icon? First of all thanks for this great guide! When I click on one of these links it will open a social media page in the current tab. Is it possible to open these links in a new tab? I am trying to enter the html suggested in this post into my website (Sandvox) software, and the link seems to work, but the image remains a blue box with a question mark. I tried to create a hidden folder in my site with the Twitter png file I want to use, but it kept giving me the same blue error box. I then went to my cPanel in GoDaddy and created a folder “remote Images” and uploaded the twitter social media image, checked it under preview and it worked, but when I added the URL to the cPanel folder to the html, I again continue to get the blue box with question mark. The link works and takes me to my twitter account, but I can’t seem to get the image placed somewhere for the html to pull it and display it properly. Any help/suggestions would be greatly appreciated. Hey john, thanks for the tutorial my only issue is im using the digg digg plugin and the icons are not aligned properly im assuming i have to edit the css but im not that familiar with how to align the icons on that format. Hey, this is a great tutorial! I am a complete newbie to all things codey, but am trying to start up a travel blog with my partner. I’m already using a plugin for social media icons, but they don’t really match the theme of the blog at the moment, and so I wanted to customise my own. I have downloaded the icons, saved them to my computer and then uploaded them to my media gallery as suggested in your post, and have completed all the coding just fine – however, when I look at the actual page the images don’t seem to show up! They’re just replaced by the image you often get when a image fails to load, so I must be doing something wrong but I don’t have the knowlegde to know what exactly! Any pointers please? I feel like I’m so close to getting them to look right but I just can’t make them appear as they should! Thanks in advance for your help :) I’d really appreciate it! You are super close! It looks like you have accidentally included two sets of quotations marks in all of your image links. For example, your facebook links reads < img alt="FACEBOOK" src=""http://... Same thing at the end of the source file (after .jgp) Change those two things one each image, and you should be set! It worked!! :) Thank you!! I just played around like you said with the quotation marks, some of them previously looked like the ones in your above post, the curly speechy kind, and instead I replaced them all with the same ” and it’s now working like a dream! I am experiencing the same issue as Annabel and I do not have double quotes. What would you suggest for my circumstance? The best thing is to double check that you have the code correct and nothing else. From there, you might check your server or hosting if there’s some reason the images aren’t showing. You can test this by trying to go directly to the image link and seeing if it loads. If it doesn’t, then the issue is elsewhere. If it does, the issue has to do with your code. I am confused with the word “wordpress”. How do you know if your site is wordpress or not? By the way this is awesome. Thank for sharing. In short, it would be the platform on which you set your site up. If wordpress doesn’t sound familiar, I’d guess it’s on something else. The fastest way I can suggest seeing if your site is on wordpress is to go to this url: http://mysite.com/wp-login/ (obviously, changing mysite.com to your site). If you get an error (likely a 404 page), you’re not on the wordpress platform. If you’re on wordpress, it will take you to your specific login page. However, it’s likely that this tutorial will work regardless of platform. You might just have to make a few adjustments. Any platform that allows an HTML code to be placed should work. Thank you for your reply. I am still trying to figure out the correct code to use for the HTML. Where do I put the image coding at? Hi! Great tutorial, thank you for sharing this. I just tried this on my wordpress self hosted site and they are showing up vertically. Do you know how to get them horizontal? Yes! It worked. You rock. Thanks! Anyone have advice for how to do this on blogger? I would be very grateful! Minimalist Baker you are fabulous!!! Such a great resource!! tags, but I don’t think so. The big difference, however, is that you won’t be able to upload the images directly to blogger. For this, I’d recommend using your picasa web album, photobucket, or something similar. From there, you can copy the direct links and use them in your “src=” code. Hey Alexis, you’re fine. Personally, I would upload each image individually so you can use a separate image tag ( ) for each icon. That way, if you ever want to update your icons/add new ones, etc., you will only need to move a few lines of the code. Does that make sense?